Other than the location of the first apartment there was nothing positive about the experience dealing with Primos NYC inc. I loved the apartment, very spacious. Every window had a beautiful view. It was really nice and comfortable. It was equipped with everything we needed to make our stay unforgettable. Spectacular view of the Hudson and the roof top lounge and patio views were amazing also! Conveniently located within waking distance of Starbucks and grocery stores steps away from parking garage that was reasonably priced! Friendly staff that met us on time waited for us to drop off our car at garage then escorted us in and gave us a quick informative tour of the apartment. Very friendly staff quick to respond to any questions we had throughout our stay will deffinately be booking with them again! 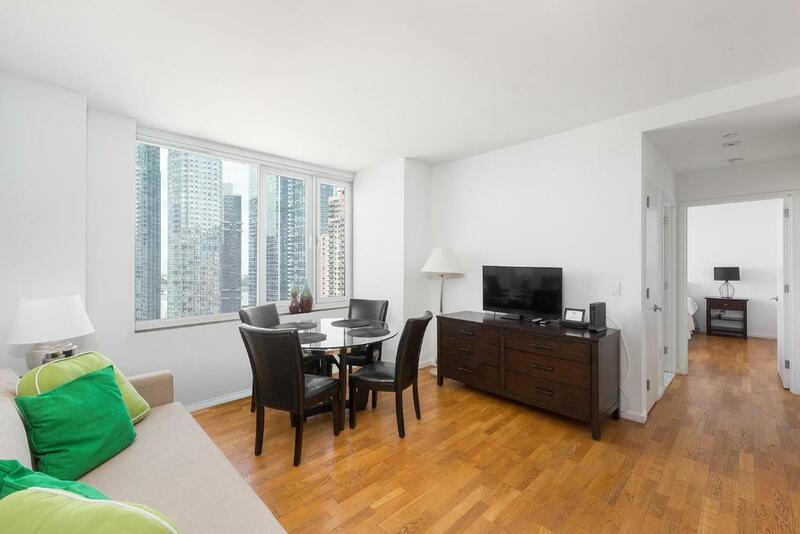 The location was good and the Alteria bldg @ 635 w42nd apartment 23D was comfortable for 6 had a washer & dryer and had a nice view of the Hudson River. The host helped with our luggage and took time to explain the checkout process. There is absolutely no denying that the location of this place is absolutely amazing. I mean, we could see the statue of liberty from outside our bedroom window, the Hudson Greenway, is literally on your doorstep as are the restaurants of restaurant row and 9th avenue. If you're keen on a walking holiday, in my view this is a location difficult to be beat. I stayed with my husband and our infant son for 8 nights and the inclusion of the washing machine and dryer was a godsend. If you're a group who don't really care about your room but want a decent base this would be brilliant for you (I'm thinking groups of young people or couples keen to hit the city for a few nights) and make it a good value for money option. Every aspect of this property was perfect. The hosts were extremely accommodating and answered every email and phone call we made to them promptly. They even held our luggage on the day we checked out so we could continue to tour the city!! The views were outstanding and the balcony on the roof is to die for. We will definitely be booking again!! The refrigerator is sub-zero quite decent. Appliance is bosch. Very nice. The size of the apartment was amazing and the views were incredible!! AC worked really well. Refuse room on the same floor. A lot of towels for just the 2 of us. 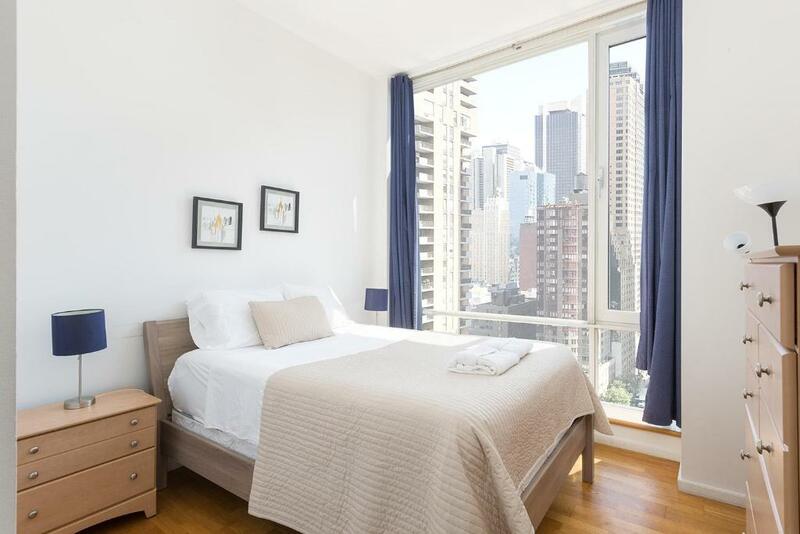 Lock in a great price for Amazing Apartment- Walking Distance to Times SQ – rated 8 by recent guests! 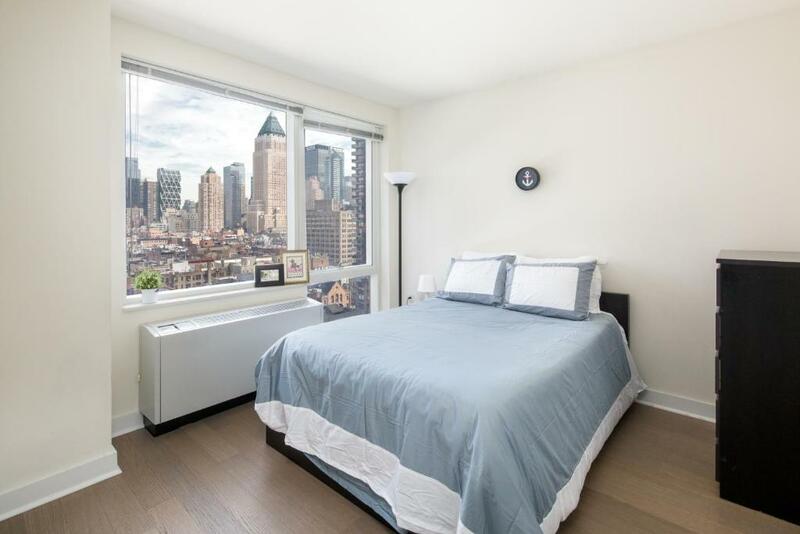 Amazing Apartment- Walking Distance to Times SQ This rating is a reflection of how the property compares to the industry standard when it comes to price, facilities and services available. It's based on a self-evaluation by the property. Use this rating to help choose your stay! 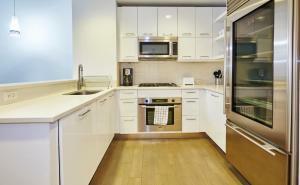 This self-service apartment, located in Midtown Manhattan, offers accommodations in New York City. Linens and towels are provided as is air conditioning and free WiFi. 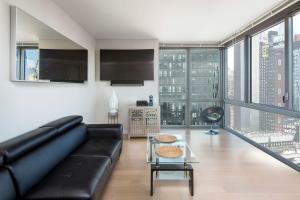 Luggage service is provided at Amazing Apartment- Walking Distance to Times SQ. Time Square is within 0.7 mi of the property. Midtown West is a great option for travelers that are interested in sightseeing, the theater and shopping. Airport transfer, discounted tickets to the Empire State Building and a variety of guided tours are available by request for an additional fee. LaGuardia Airport is 6.8 mi from the property. 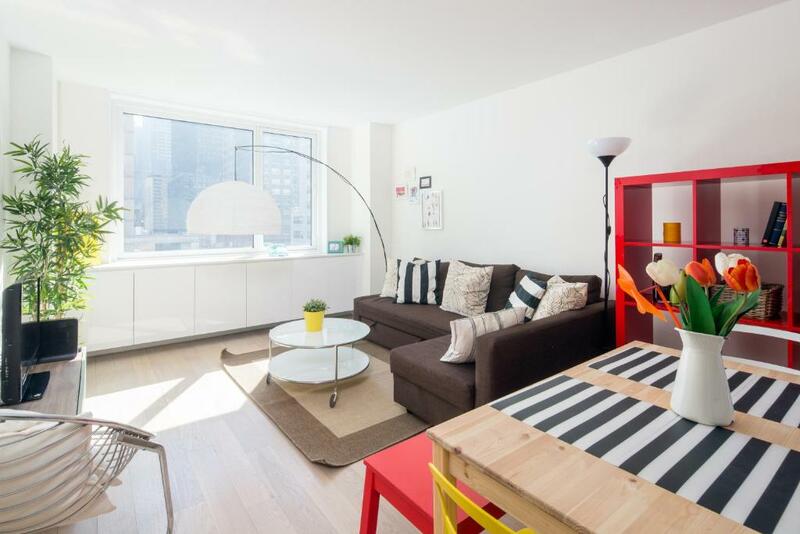 When would you like to stay at Amazing Apartment- Walking Distance to Times SQ? This apartment has two large bedrooms and bathrooms, situated in the best area of Mid Town. It’s a perfect area to get to know New York, but also to enjoy the more peaceful atmosphere that the area has to offer. Although our office is based in 311 west 43rd street, the apartment are not located in that same address but in the area around. We write that address because all of the apartment are placed around. With Times Square only 5 minutes walking distance away, it’s very well situated in order to get around town easily or so you can have a stroll through town on your way back from dinner at some of the finest restaurants New York has to offer. Midtown West is a great option for travellers that are interested in sightseeing, the theatre and shopping. The accommodation is perfect for 6 guests or even 7 to 8 thanks to the availability of additional beds. It is also fitted with heating and air conditioning to deal with the heat and cold of the Big Apple. 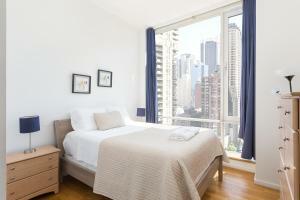 Moreover, this accommodation’s rating is one of the best of New York. All our clients end up highly satisfied with their experience and many come back as return customers. We are not just an online platform offering tourist services; we are a family of young, creative and innovative individuals who deliver flexible and personal support that our guests and hosts require. We provide care and attention to our guests by being there for them before, during, and after their stay. rip. Even though we are not a hotel in the traditional sense our mission is to make your trip as easy as possible and to help with what ever we can, and thus we offer: - Clean towels and bed sheets for all guests. - Telephone assistance 17 hours a day. - WhatsApp group (we create a WhatsApp group with members of our team where you can contact us at any time and for what ever you need, before, during and after your trip) - Luggage service: we’ll be your bellboy! We’ll help you with your luggage during check in and check out. - Transfer service: we will help you to book the best transfer service in all of New York so you won’t have to worry about a thing. They’ll be waiting for you at the airport and they’ll leave you right at out Meeting Point (likewise for the return transfer). All of our apartments will let you experience New York like a local! 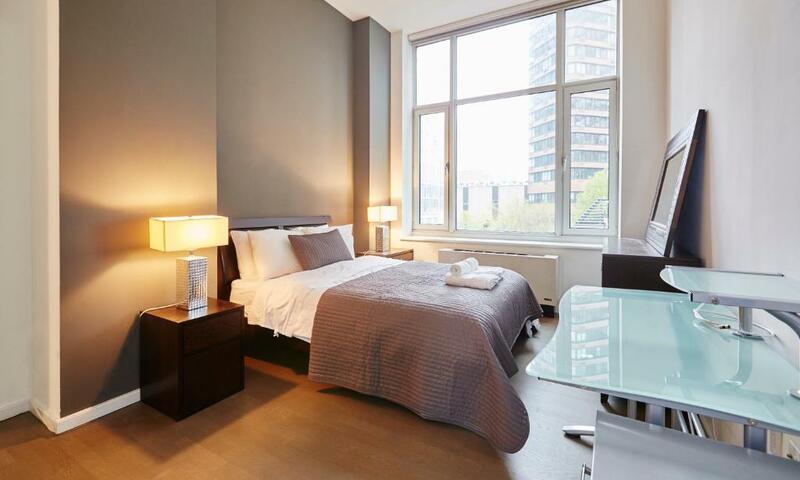 Every apartment is conveniently situated to the subway, sights and tourist attractions. You will instantly feel like you are at home. 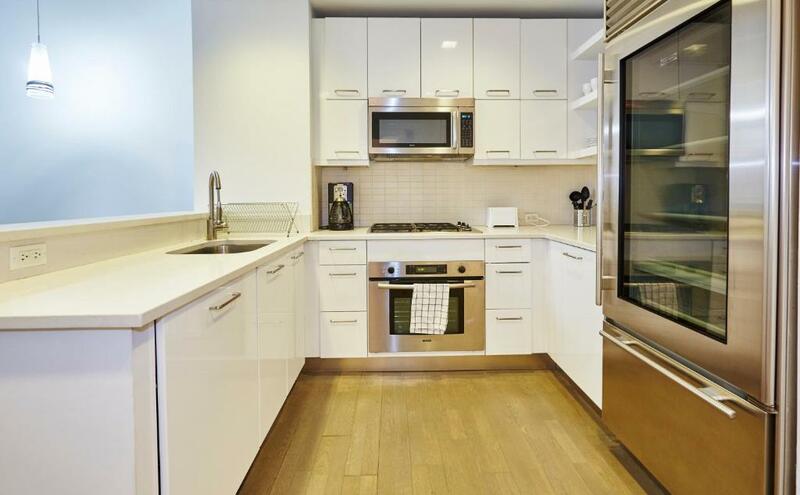 This apartment in midtown Manhattan is spacious, clean, charming and inviting, and located in the heart of it all. Just a few steps away from Times Square, all the Broadway shows, restaurants, bars and nightlife, it is the perfect place to stay and experience ‘the city that never sleeps’. My Times Square apartment is cool, cozy and comfortable...it is very New York. Our guests love this place… its character adds all for a true New York City experience. Area Info – This neighborhood is a great choice for travelers interested in skyline views, city walks and sightseeing – Check location Great location - show map Guests loved walking around the neighborhood! House Rules Amazing Apartment- Walking Distance to Times SQ takes special requests – add in the next step! Amazing Apartment- Walking Distance to Times SQ accepts these cards and reserves the right to temporarily hold an amount prior to arrival. Please note that a refundable security deposit of USD 200 will be charged 48 hours prior to check in. The refund is subject to a damage inspection of the accommodations. Please note, higher units, with views, are subject to availability. Please inform Amazing Apartment- Walking Distance to Times SQ of your expected arrival time in advance. You can use the Special Requests box when booking, or contact the property directly using the contact details in your confirmation. Please note that check-in and key collection take place at: 607 11th Avenue (Sunrise Market Place), New York 10036. Meeting to get the keys. Venue kept changing. Taken thru back access...all very underhanded. Obviously sub let when they are not supposed to. Fab Appartment on 43rd floor. Fantastic views from every window. Furnished to very good standard. Very clean. The staff did not keep up their word. We originally arranged for a 4 pm check in. We were at the meeting point on time, standing on the street on a freezing afternoon, 7-months pregnant with a senior relative and had to wait standing on the street for three hours. I called five times and they kept saying someone was on their way to bring us the keys. They finally appeared at 6.45 pm with no clear explanation or apologies. Furthermore, we were told someone would bring a second pair of keys (we rented an apartment for 5 people) which never occurred. To make matters worse, we received a phone call that same evening, requesting us to change apartments on the following day, due to some mistake on their side with the booking arrangements (we were eligible for a bigger apartment). We did accept to change apartments after having already settled, but requested that in compensation for the delay with the check in and the change in apartments, that they would consider allowing us for a late check out. The representative from “Los Primos” said he would check with the manager/owner and later left me a voice message (which I have recorded) confirming a late check out was possible if we changed apartments. We did move, and the day after moving we received an email from a different representative saying that a late check out not possible and that he knew nothing about such arrangement. I said I had the message recorded but he said he couldn’t do anything and that they could not even offer the luggage service (which was offered at time of booking). This meant we were forced to leave earlier than what was agreed and had to take our luggage with us in the morning (our flight was in the late afternoon). Very unprofessional behaviour. The representatives never provided their names and the emails came from a generic mailbox. I felt we acted in good faith and they completely lied to us. We had to arrive through a dirty back utility entrance so as not to disturb the residents.. no internet or tv for the whole week even after repeatedly telling them.. some power points not working , missing globes in lights(they fixed them) Just seemed a little dodgy to have to ring South America to get to speak to someone about these problems when there was a perfectly capable guy that met and showed us in.. The apartment itself was perfect for what we needed but they need to pay attention to the little things,to not get internet in NYC is not acceptable in this day and age.it would have cost us a fortune in data , not looking forward to getting our bill when we return home. Check in was super sketchy. Meeting place got changed 3 times while I was on my way to NYC. Met a guy by a parking garage and tailgated guy through a secure service entry. Had to go up the very dirty service elevator. Guy told us if anyone tried to talk to us to let him do the talking. Once at the apartment he said if anyone asked we were friends of Ben. The first night was OK but the next morning was definitely an issue. I went to NYC for security training and couldn’t believe what I was experiencing so far at this apartment. My training started at 10 am and I got a call at 9:50 saying that there was a problem and we had to pack our luggage and move to another apartment and they would give us a credit for one night. When I said I was busy with what I came to New York for, they said they were going to pack our bags and move them to another apartment. We told them no and on break went and packed our bags and they just left the door open to the other place and the keys on the counter. It was too sketchy so we booked a hotel. Not cheap last minute in Manhattan. Got another message that night that checkout couldn’t be at 11am anymore it had to be by 8:30am but they could hold our bags until 6pm. No thanks. The hallways were not very clean. The apartment was clean, but the floors had lots of dust, especially in the corners. We were never given the address of the property when we booked it wish was messy. We were first given a address to meet up to pick up the keys then in the last hour they changed the address by sending us a message on booking.com wish we could not see as we had no internet connection after arriving to the US. We were also brought in to the apartment from the back service door as they said we could not go from the main entrance as they don't like people staying there from booking sites (wish was not great impression for our guests). The phone number we were given did not respond either. Apart from all this the apartment itself is clean and comfortable and with great views. As previous reviews have mentioned the arrival process was very strange but as air bnb not allowed on NYC this is obviously why. This was further made clear when we had the police and building manager at our door asking all sorts of questions. Highly uncomfortable. Ruined our stay a bit and this was on our second day. Apartment was clean and well presented and the people we did deal with were friendly. Held our luggage on the last day and we picked up from the back entrance. Good location and view. The check in was a bit dodgy. Met two young people on a pier and then sneaked in the back door. But this was expected after reading other reviews. Had absolutely no problems after that. The apartment was perfect. Very clean and spacious. It was great for our family. It was in a lovely area and only a few blocks from Times Square. The floor outside the bathroom in the hallway had a big bump in it we had a couple of close calls tripping over it. The introduction to the apartment was not something I would like to have to do again. It left me feeling very uneasy about the whole situation! The location was great we were on the 43rd floor so had great views of the city. Only a few blocks from Times Square. The apartment had a washing machine and dryer which was great we didn’t bring any dirty laundry home with us.